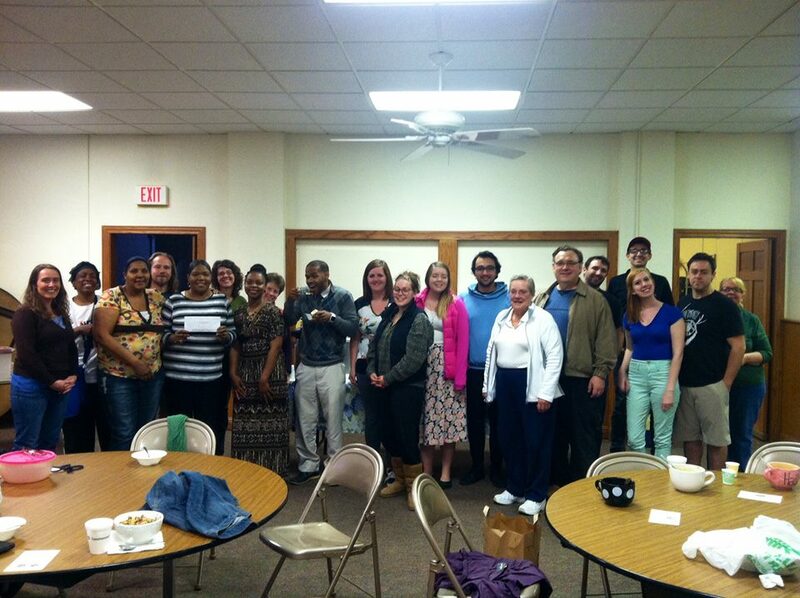 Our Soup Family – powering change in #LoveLansing one bowl of soup at a time. Congrats to Woman Behind the Mask on winning $130 at SoupGrant! Woman Behind the Mask meets every week at NorthWest Initiative to provide women a safe and secure place to gather for mutual support. WBM would like to use the money towards purchasing a van and getting a logo designed for their group. Know someone with a van or graphic design skills who might be able to donate their time or give a reduced rate? Let us know and we’ll pass on the word to WBM! Who’s next? Apply by May 1 to present your locally-rooted, Lansing-minded idea on May 21! 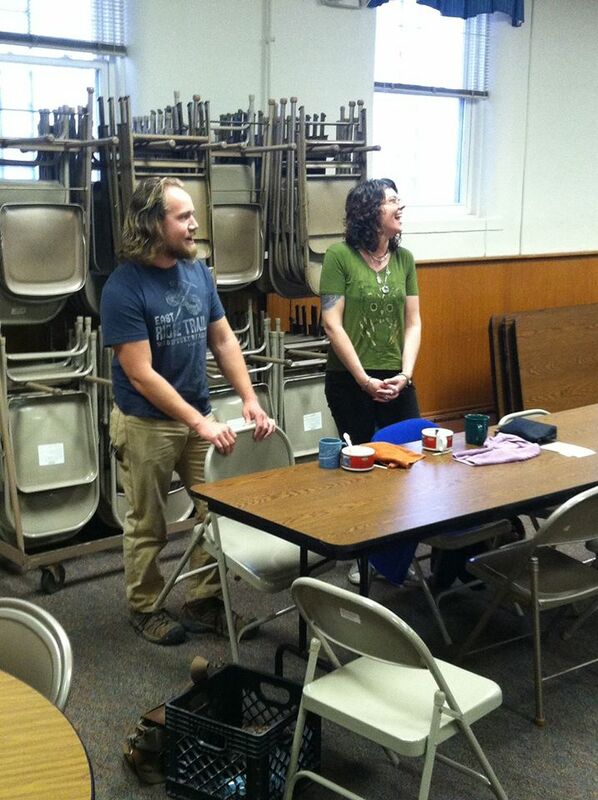 Kirk and Patti from HerBlends of Plenty came back again to talk about their new venture – Abundance at the Avenue Cafe. Join us April 27 at the Avenue for a preview pop-up dinner at 6:30. 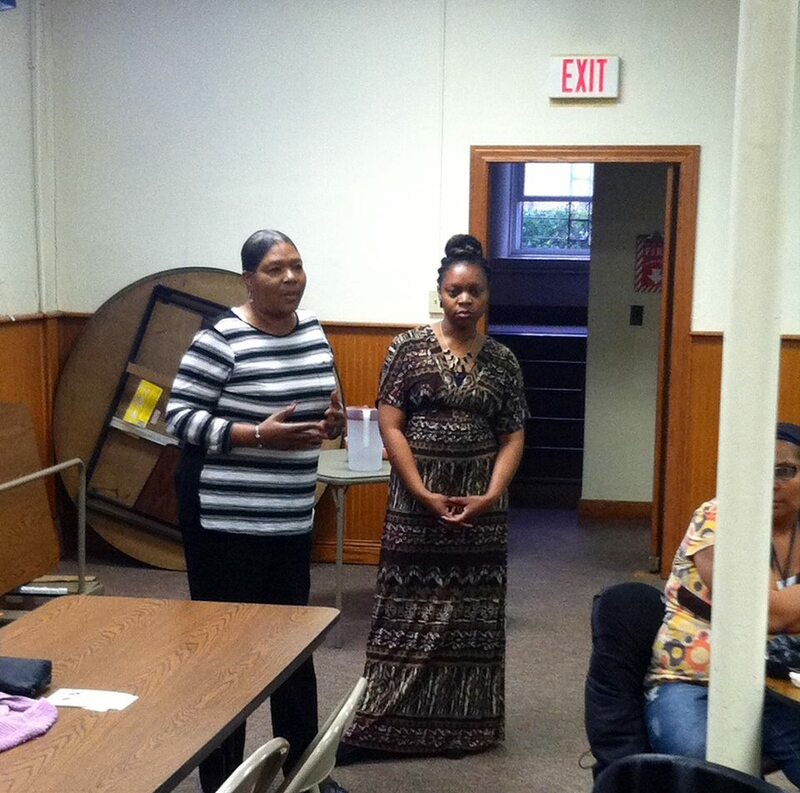 Elizabeth Collins-Jones and Danyele Evans from Woman Behind the Mask talk about their work to provide a safe and supportive place for women in Lansing to meet weekly. 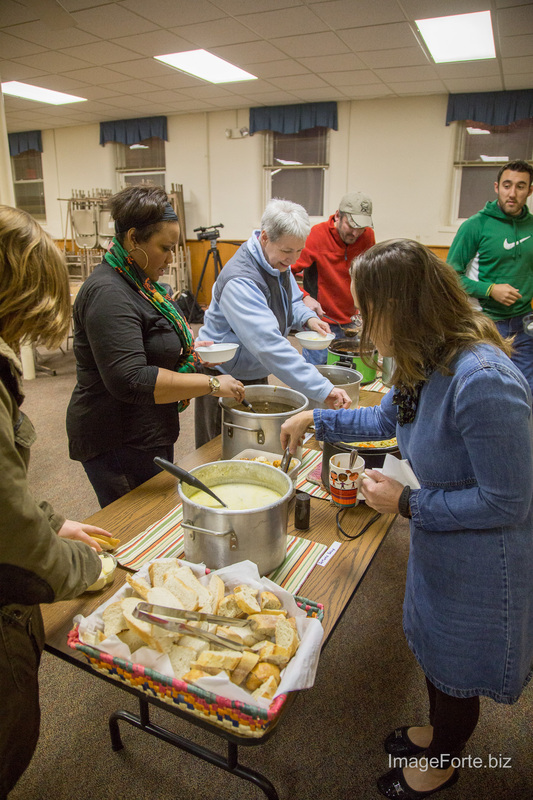 On March 19, about 30 Lansingites gathered in the basement of Grace Lutheran ELCA to share a hearty, healthy, and delicious meal – and, at the same time, to support a great cause. Two very different groups came to present their ideas, both hoping to make the Lansing area a healthier and happier place to live – and eat! The first, HerBlends of Plenty, has been joining us faithfully month after month since late 2014, every month treating us to delicious, locally-sourced tea. 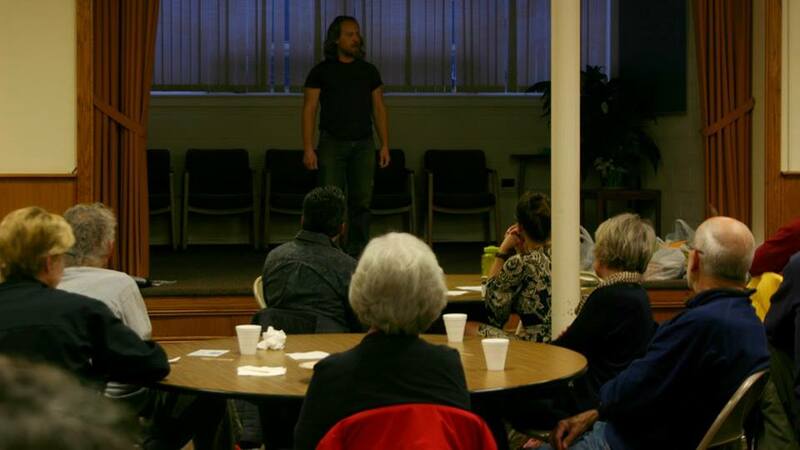 We look forward to having them with us every third Thursday, especially this month where they joined us to present their idea for an accessible and affordable farm-to-table community kitchen and tea house on Lansing’s Eastside. The night of SoupGrant, they also announced the location for their new brick-and-mortar establishment: Avenue Cafe at 2021 Michigan Ave.
Kirk from HerBlends of Plenty. 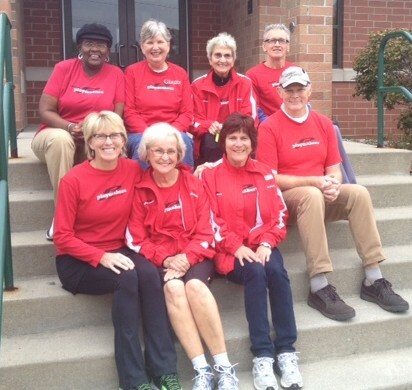 Our second contender was Team Playmakers from St. Vincent Catholic Charities. This group of volunteers works with foster children in need of support and stability in their lives as well as a healthy, physical outlet. As Ann shared with us, what the kids at St. Vincent need more than anything is the constancy of a reliable adult presence in their lives. Everyone, I think, was deeply impressed by the stories of kids who have gone from exhibiting indifference or resistance to the running program to enthusiastic participation as they see their mentors return faithfully week after week. Ann from Team Playmakers at St. Vincent. Those who have been to SoupGrant before know just how hard it is to have two great presentations on the same night and to be forced to choose which one to support. (I myself never vote because it’s just too hard to make up my mind!) Unfortunately, everyone gets only one vote, and only one can win. Maybe Kirk (from HerBlends) encouraging everyone to vote for Team Playmakers made the decision a little easier this month. In the end, Team Playmakers won your votes and, in doing so, your generous donations totaling $152. Team Playmakers will be able to use this money to pay for registration fees, training clothes, and program incentives for the kids. You can find more info about them here. If you would like to support HerBlends of Plenty, be sure to like them on Facebook and follow the developments as they launch their crowd-funding campaign. Having an affordable, farm-to-table option sounds like a great addition to Lansing’s Eastside and we can’t wait for them to open their doors! Finally, we got to welcome the Clinton County FFA back this month. We were thrilled to not only hear about how business has been going for them since they won SoupGrant last October, we also got to see the fruit of their dedication as they followed through on their promise to collect donations for the Lansing Area AIDS Network pantry, a pledge they made after beating out LAAN to win that month’s SoupGrant. 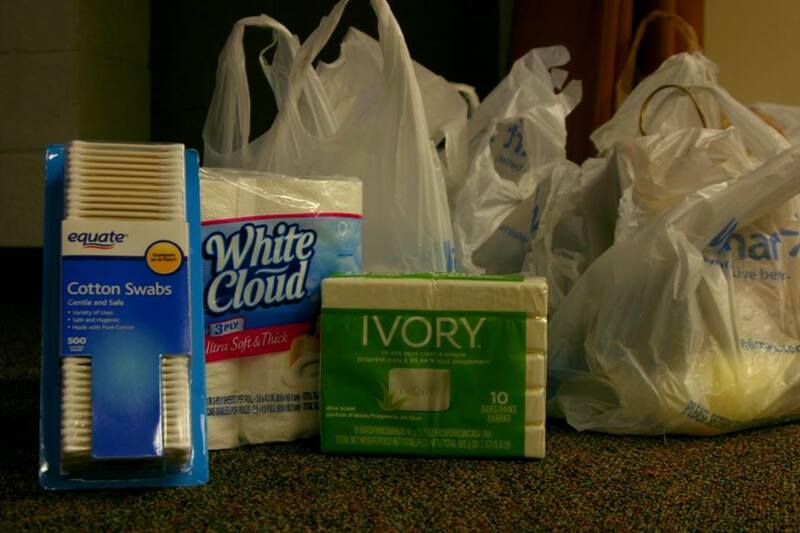 FFA of Clinton County donated a lot of great items to LAAN as well as over $140! 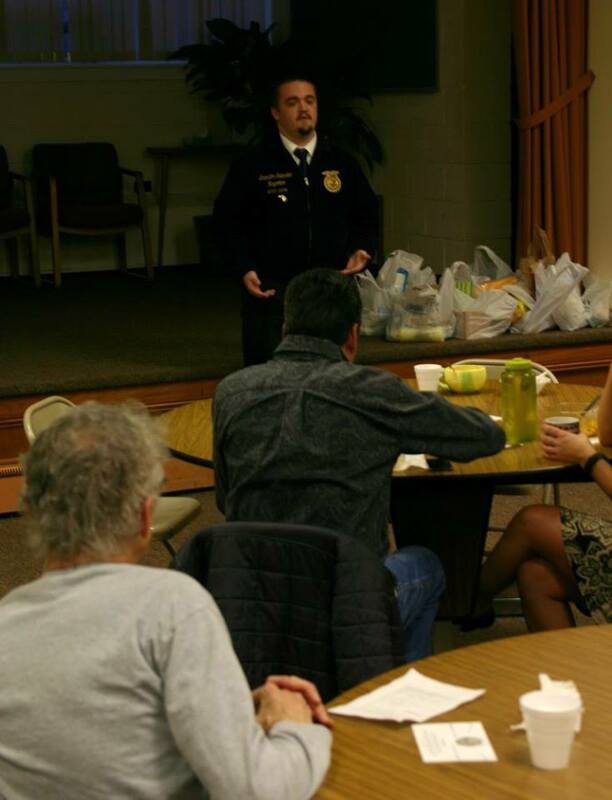 Clinton County FFA joined us to update us about how business is going for them five months after winning SoupGrant – and also to drop off all those bags of donations for LAAN that you see on the stage! Thank you again to everyone who joined us. Since 2013, you have helped raise $2153 – and that’s not including the numerous second-hand donations that have been made by those who have given additional time, funds, and resources to folks who presented at SoupGrant! 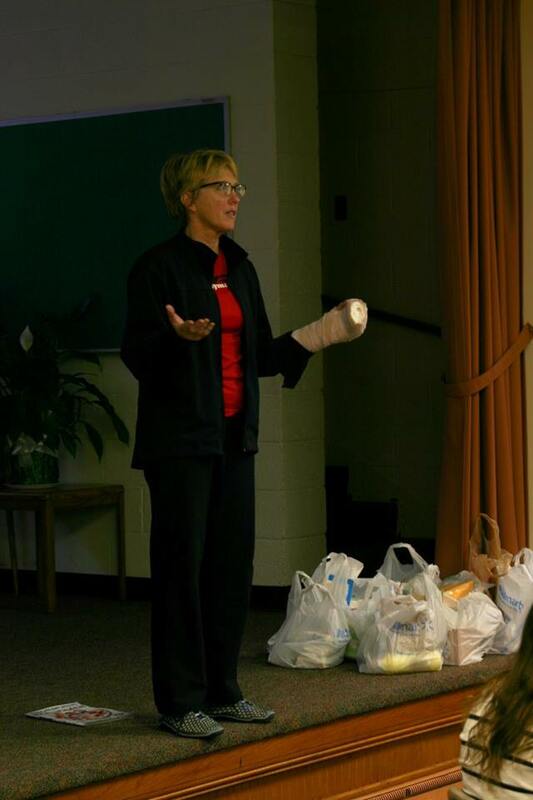 We are working to partner with past SoupGrant presenters to create some volunteer events around Lansing in the coming months. If that interests you, be sure to join our Meetup page! It’s free and it’s a great way to see what our friends are up to around town. See you April 16 for our next SoupGrant! We still have room for YOUR application, so head on over to the application page and fill one out! Got questions? Check out the FAQs or e-mail us (SoupGrantLansing@gmail.com) if you can’t find the answer to your question!